Starting with what is new, the new Oculus Rift DK2 comes with a 1080p OLED display, something that was really needed in order to improve the level of detail that the older smaller resolution 1280×800 LCD display provided, especially considering the fact that due to the way that the Rift works you only get half of the resolution per eye and not the pixels of the whole screen are actually being used. The new Oculus Rift DK2 also comes with a new better looking design and a bit more complex setup as it includes an extra infrared only camera used to track the integrated active IR led markers in the headset. The headset weights slightly more as it has the external control box that the previous kit had (essentially the screen controller electronics) built inside in the DK2, but the few ore extra grams don’t seem to be a problem. Another interesting improvement is that the new DK2 comes with only two sets of interchangeable lenses instead of the three that the first dev kit had, the lenses are slightly better in terms of optical performance and seem to be slightly larger, however the total FOV of the new DK2 seems to be about 10% smaller as compared to the 110 degrees available with the first dev kit. The included web camera is something that we don’t like that much. It seems to essentially be a standard web camera with a filter applied to the lens to block the visible light and pass only infrared light. The idea is to track the specially positioned IR leds inside the front and side parts of the headset and use that extra positional information to add extra sense of realism inside the virtual world. The idea is generally good, however the range that the camera operates in is very limited and if you start moving more you can quickly get out of the range and the extra functionality such as leaning or crouching in the virtual world as you do the same in the real world disappears. Other than that the camera tracking is probably used to also help fighting with the drift that the built in sensors for tracking head movement are prone to. The web camera tracking makes things more complex and limits your movements more than it gives you freedom and the advantages are actually not that much, so Oculus should probably think of alternatives to replace the camera-based tracking. If they want a device like the Oculus Rift to be successful and go mainstream it should be easy to setup and use and not complex to setup and use and limiting the experience of the users. A few words about the display, it was a bit of a surprise to find the screen from a Samsung Galaxy Note 3 inside the Oculus Rift DK2. But it was probably not very easy for the company to find a good and small enough in size 1080p OLED display that will not cost a fortune and even though Oculus is now owned by Facebook the number of produced development kits is not so high as to get a screen specially developed for them. With that said the OLED display inside the new DK2 is definitely a serious improvement over the previously used LCD panel, though it is still not the perfect screen for the Rift. Resolution wise the new display is definitely a serious improvement, though you can still see the pixels zoomed though the lenses, so an even higher resolution screen is needed for the final consumer version in order to really polish the experience. 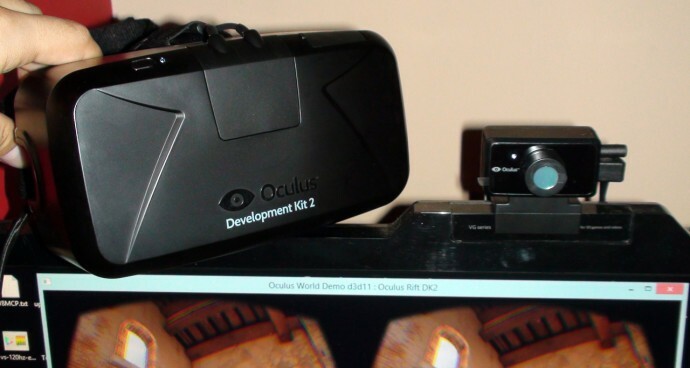 The higher resolution however also causes some concerns about the need for more processing power from the graphics card of the computer used to power the Oculus Rift, so initially there will most likely be some compromise. If you were hoping the 1080p screen to be enough, then you will be left disappointed it is not enough when zoomed through the lenses and split between the two eyes. What the new OLED display does pretty well, though not perfectly, is to almost eliminate the annoying and nausea inducing for many people motion blur while panning around. The low persistence OLED display does a great job, though we have noticed that in high contrasting scenes where you have dark objects surrounded by light background you can still see some motion blur. For example the standard Oculus demo the stairs inside the house or the trees outside by the wall – depending on the version of the demo you try. The version of the demo included with the SDK apparently is somewhat darker and in it the motion blur is noticeable when looking around the stairs and on the standalone version of the demo that is apparently brighter the motion blur is noticeable when looking around the trees outside. A bit of a disappointment, but not that bad actually to ruin the overall great experience that the bright and high resolution new OLED display provides. The new lenses, only two sets, seem to offer better optical quality and somewhat different distortion. While the lenses are bigger the actual FOV you get is slightly reduced, but still more than great. The expectations that the larger lenses would also provide a larger sweet spot for viewing without seeing some chromatic aberrations caused by the distortion of the optics ended up in vain however, maybe this needs some more work on the software side responsible for the distortion of the images displayed that need to compensate for the distortion of the optics. The good side is that the standard lens works pretty well for people that are wearing prescription glasses and are nearsighted as if your glasses are not so strong you will most likely have no problem using them instead of having to wear the glasses. The same lens is for people that don’t have problems with their vision and the second lens is for people with worse eyesight apparently, so it is like Oculus decided to “keep” the B and C lenses from the first dev kit in terms of capabilities. 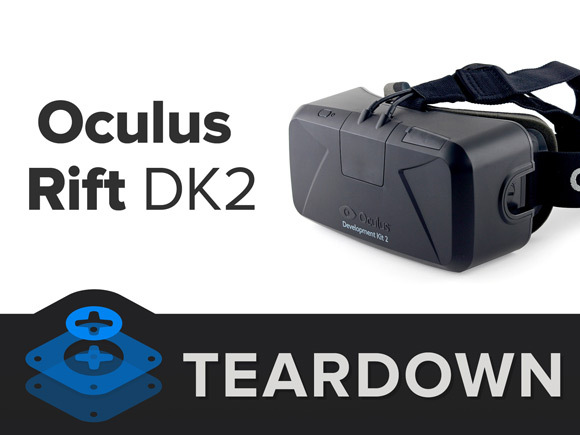 The new DK2 comes with a new mode that may help greatly in the usability of the device as it can output directly to the display of the Rift the compatible applications without actually having the device as an extended or cloned display like you had to before that. This however will work only with applications compiled with the new versions of the SDK supporting the DK2 and since there are also quite a few other differences the applications designed for the DK1 should be updated to be properly used on the new development kit anyway. You can of course still use the Rift as an additional display available to ensure compatibility with older apps and to allow for more flexibility of the use of the device. The new Direct to Rift mode is a good example of the way Oculus should be moving – making things easier and working problem free from the user and not having to bother him with things like moving primary displays or having issues with Vsync and tearing… just open the application and it will automatically appear where it should be – on the display of the Rift. With all of the above said the new Oculus Rift DK2 is definitely a nice improvement from the first development kit and if it is the first Rift that you get to try you will be really excited and pleasantly surprised from the experience. If you however have tried and used the first DK1 you may not be as excited from the improvements and changes even though they are not small, they are simply not enough to get the DK2 to the level of the product that should be offered to the end user. There is much more work needed to be done and we may need to get a 3rd version of the dev kit next year that will be closer to what the consumer version might be and expect an end user product probably by the end of next year of things continue to progress well. 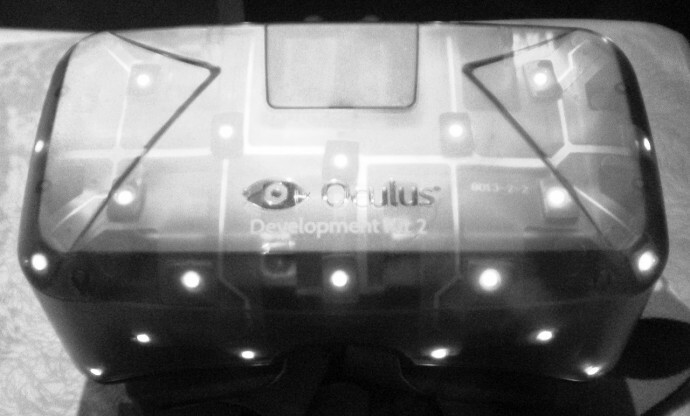 Last week Oculus has announced that they are starting with the shipments of the second version of their Development Kit named DK2. It seems that some people already have received their units, including iFixit who were fast to disassemble the unit and show us what is inside and what components are used. Surprisingly they have found out that Oculus has used the 5.7″ Super AMOLED 1080p display from the Samsung Galaxy Note 3 and it is the complete panel that includes the top glass and the touch panel, not only the LCD. This probably allowed Oculus to easily source a good 1080p resolution OLED display with a size small enough to fit inside the headset, and if it works well inside the DK2 we are Ok with it. 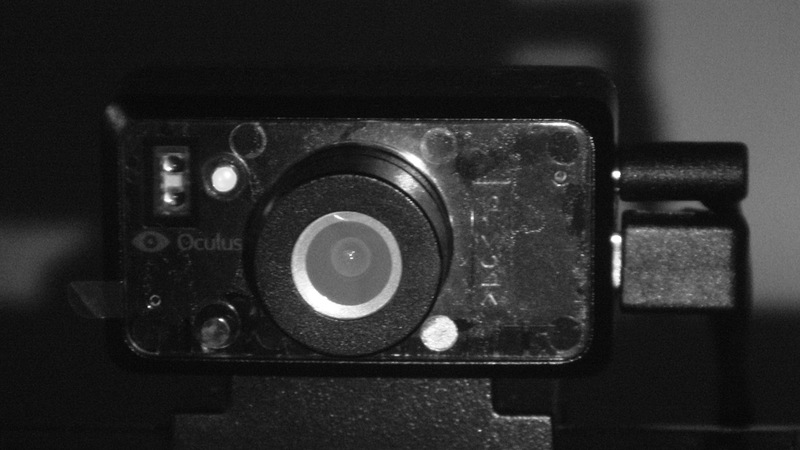 It was just surprising to see that Oculus did not use only the LCD, but the complete replacement front panel from the Note 3, but hopefully by the time for the final retail unit they will be addressing this. DK2s have started shipping out to developers in the Americas, Europe, Africa, and Asia, and we expect to have over 9000 DK2s in developers’ hands by the end of next week. We’re working out a minor snag for Oceanic customers, but we hope to have the issue resolved soon. 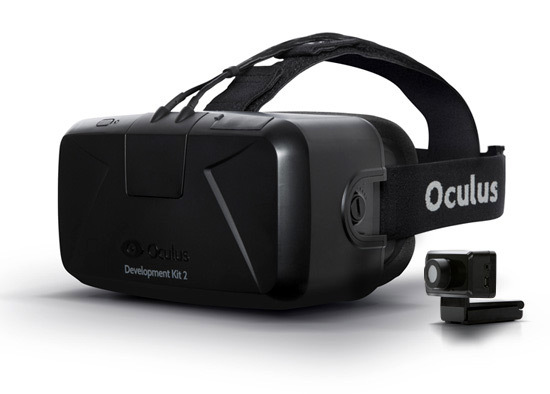 Oculus has announced the DK2, the second development kit for the Oculus Rift, already available for pre-order at $350 USD and shipping in July. The second development kit features many of the key technical breakthroughs and core elements of the consumer Rift including a low-persistence, high-definition display and precise, low-latency positional head tracking. The new DK2 isn’t going to be identical to the upcoming consumer version of the Rift, however it will be very close to what you should expect from the final consumer model. All the content developed using DK2 will supposedly work with the consumer Rift. The new DK2 uses a low persistence OLED display to eliminate motion blur and judder, two of the biggest contributors to simulator sickness. Low persistence also makes the scene appear more visually stable, increasing the potential for presence. The new high-definition 960×1080 per-eye display (Full HD OLED screen split into two) reduces the screen-door effect and improves clarity, color, and contrast according to Oculus. The new Oculus DK2 is supposed to also come with integrated precise, low-latency positional head tracking solution using an external camera that allows you to move with 6-degrees-of-freedom and opens up all sorts of new gameplay opportunities like peering around corners, leaning in to get a closer look at objects in the world, and kicking back on a virtual beach. Precise positional tracking is another key requirement for comfortable virtual reality; without it, an enormous amount of your real world movement is lost. Time to pre-order… total cost was $486 USD with the shipping to Europe and taxes added to the price of the unit.